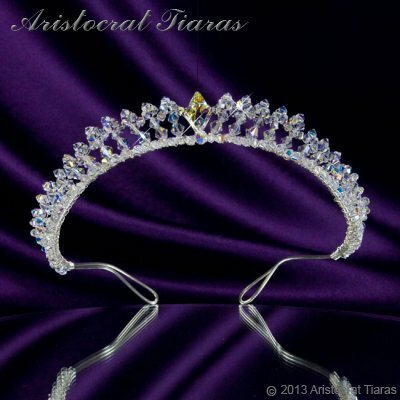 The Princess Carmina Swarovski tiara from Aristocrat Tiaras feartures a Swarovski diamond shaped AB bead as the focus and is delicately offset with decreasing rows of silver wire spikes with crystal beads. This tiara is encrusted with crystal AB beads along its visible length to create a sparkle effect. Princess Carmina is simple, but elegant crystal bridal tiara will add sparkle to any bride’s outfit on her wedding day and could also be the crowning touch as a school prom accessory.